Alighiero Boetti‘s retrospective, Game Plan is on view at London’s Tate Modern through May 27. Considered a pioneer of Italy’s Arte Povera movement in the 1960s, Boetti sought to transcend the traditional limits of high art. His efforts produced a broad mix of media, aligned by simple materials and often playful concepts, resonant in the title of the show. Tapestry, sculpture, painting, and carefully assembled collages made of parcels and postage comprise some of the varied array of work from his career spanning nearly three decades. Sprawled across the floor of the first gallery of the exhibition is an early work, Io Che Prendo Il Sole a Toriino il 19 Gennaio of 1969. A human form is made of accumulated chunks of concrete, creating a grave-like site. The artist formed each mass by hand, leaving ironically vital indents from his clenched fingers. A butterfly is placed around the cardial region of the figure, creating a delicate and natural compliment to the durable, industrial material. 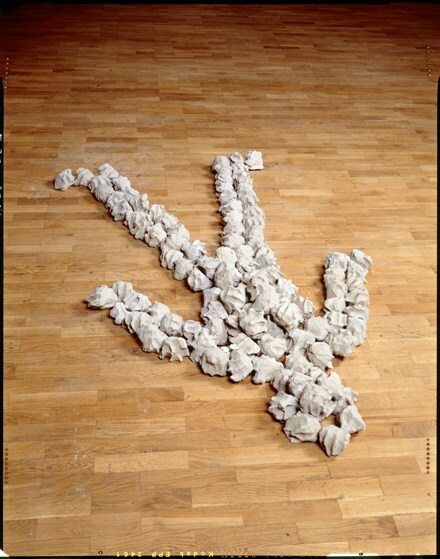 Here, Boetti explores conceptual and aesthetic dualities: life/death, hard/soft, natural/unnatural. Further devices and exercises are employed for varying effects throughout the show. Boetti’s strategic manipulation of image and language can be seen in works such as Twins of 1968. The artist was often credited as Alighiero e Boetti, creating the illusion that he was not one artist, but rather a creative pair. 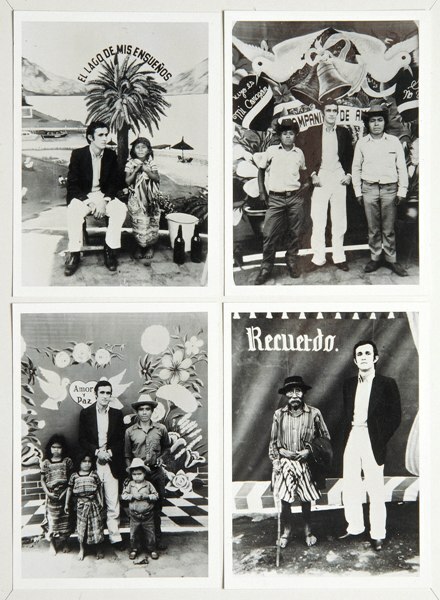 In Twins, Boetti manifests this by manipulating a photograph to include two images of himself. 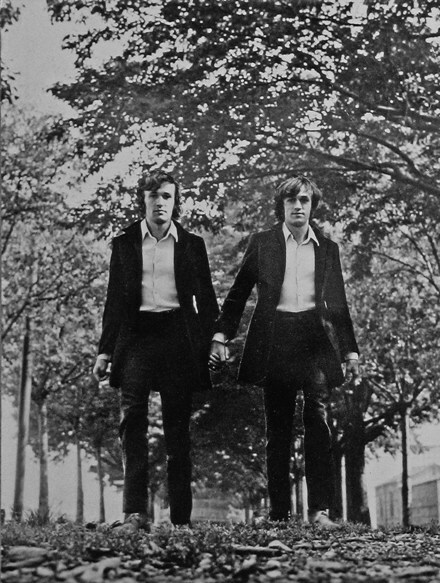 Both Boettis wear the same clothes, but with a slightly different hair style, holding hands as they proceed toward the camera. The malleability and aesthetics of language and communication are further explored through the words and letters used in much of Boetti’s repertoire. Sometimes distilled to symbol or pattern, Boetti invents abstract amalgamations of familiar parts, leaving us subject to his internal logic. Much of the exhibit is also dedicated to his postal collages—practical assemblage of real communication, or stamps laid in meticulous designs. 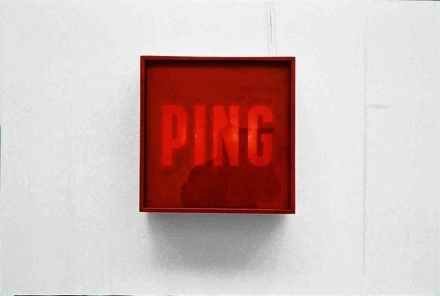 In Ping Pong from 1966, two identical red wall sculptures are hung, wired with lights to illuminate individually, one after the other—back and forth. 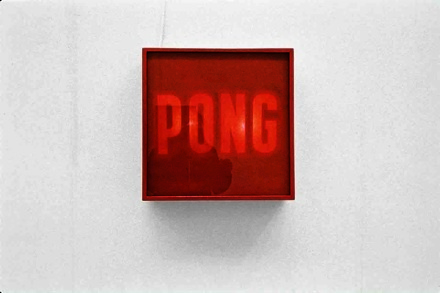 Boetti works with the dynamics of a ping pong match, creating the game through language and object. 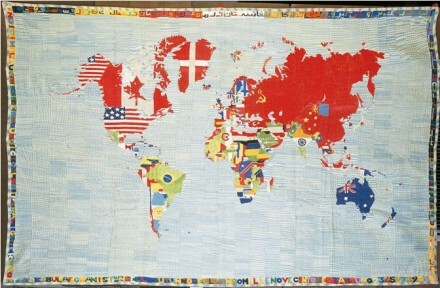 Between 1971 and 1979, Boetti shifted his focus to elaborate tapestries predominantly mapping the world in bright colors. He worked on the series until the end of his career, though during these years Boetti set up a hotel in Kabul, Afghanistan as his creative workspace, abandoning his growing notoriety in Italy. The maps highlight craftsmanship and skill, bannering every country with the design of its respective flag. In works such as Mappa (1971–72) he combines Farsi characters and the English alphabet, still infusing his attention to linguistics. Game Plan is the title apropo of an artist whose playful engagement with his audience and work were strategized and sharply executed. Boetti remained disciplined by simplicity, choosing common materials, artisan craftmanship, and exploration of universal cultural themes. 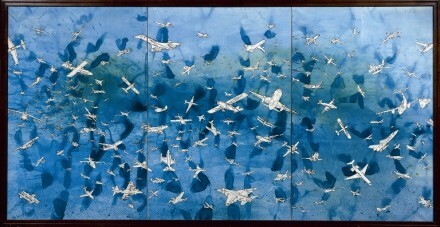 This entry was posted on Tuesday, May 15th, 2012 at 1:44 am	and is filed under Art News, Go See. You can follow any responses to this entry through the RSS 2.0 feed. You can leave a response, or trackback from your own site.